I started my W700 rigging project with lots of thought and brainstorming. From the start, my goal was to design as good of a 2 person, all water fishing vessel as I could while still being able to car top it. One of the accessories I decided I wanted was a downrigger. Luckily, I found a good deal on a used pair of Scotty 1080 downriggers and bought them. At this point I started test placing them on the 700 and was worried about how much the hull flexed. To alleviate that, I chose to plate the top of the hull with aluminum. Being that I’m a guy and like cool looking gear, I went out and bought a sheet of 1/8″ diamond plate aluminum from my local welding supply store. From there I made lots of measurements and multiple cardboard templates in order to get it right. During the templating, I thought it would be an added good measure of support to have a 4″ connecting strip integrated in the plating to keep the front hulls from even thinking about splaying out. This worked out perfectly as a mounting point in front of the cockpit for my Scotty triple rod mount. The plating is bolted down on the 4 corners with 1/4-20 stainless bolts, washers, and nylocked nuts. Then I used marine rubberized aluminum rivets spaced out along the edges of the plate to keep it well attached to the hull. All holes were sealed using marine GOOP. After the plating was done, I started on the motor mount for my Honda 2.3 hp air cooled outboard. I searched everywhere I could for ideas on the motor mount and found a few pictures to base my design off of and improve upon. The finished motor mount is 1/4″ 4×4 aluminum angle, 24″ wide, welded to 2 legs made out of 3″ C channel aluminum split in half. During final fit up of the motor mount on the kayak, I ran into the issue of having the motor clamp screws too close to edge of the cockpit, making it impossible to install and remove at will. Luckily I had some thick, very dense rubber on hand and cut strips to fit under the legs of the motor mount. This brought the height of the clamp screws up enough to clear the rear cockpit edge. The motor clamps also clamp into a bolted on block of that same rubber to keep it from shifting or loosening during use. To ensure I stay legal on my outings, in Washington, any motorized vessel operating on federally patrolled water must be registered, hence the registration numbers on the sides. And while I was putting stickers on, I added the strip of fluorescent orange tape to the sides to aid safety by ensuring other boaters see me. My transponder is mounted the tried and true way as shown to me by Chris Henderson, using a duct seal boat with a thin layer of water inside, mounted in the front right hull just in front of the forward edge of the cockpit. I will post updates as I get more use in the upcoming months. 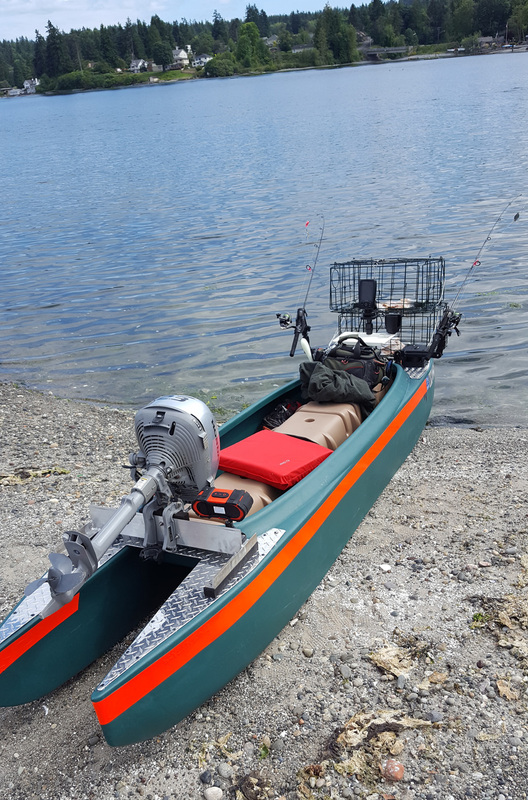 My first outing in the Puget Sound while motorized will be for crab and to search and jig for herring. I had the opportunity to take the 700 out on a test run at a local lake. The 700 handles awesome but had some motor hiccups. The lake was windy and therefore had some light chop. There was some splashing into the 700 from the front and sides but it was light and not much of a bother. I may add a piece of plexiglass between the hulls in the front but have not decided yet. Unfortunately the ground wire came out of the marine plug so I didn’t get to test out the Garmin yet. But I shall be taking more trips over the weekend and we’ll see how it goes. The Honda 2.3 is a 20″ long shaft. It does seem to kick up a decent amount on spray on the back end at full throttle and 8.5 mph so I may build a plexiglass spray shield. All in all, it handles impeccably with this motor. No instability at all, even in rollers and light chop. Crabbing this weekend didn’t yield any keepers but I had the chance to test the motor and fish finder. 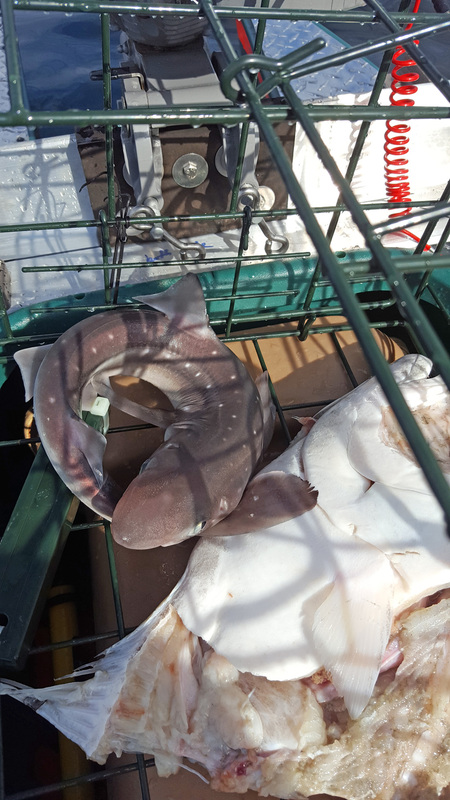 I did catch a 20″ dogfish shark and 10 small crabs though. So not a bust. Still getting a feel for the setup. Can’t wait to get the downriggers in place for salmon and kokanee fishing. Taking rigging to a new level! I love the stiffness that the diamond plate adds to the decks for adding accessories. 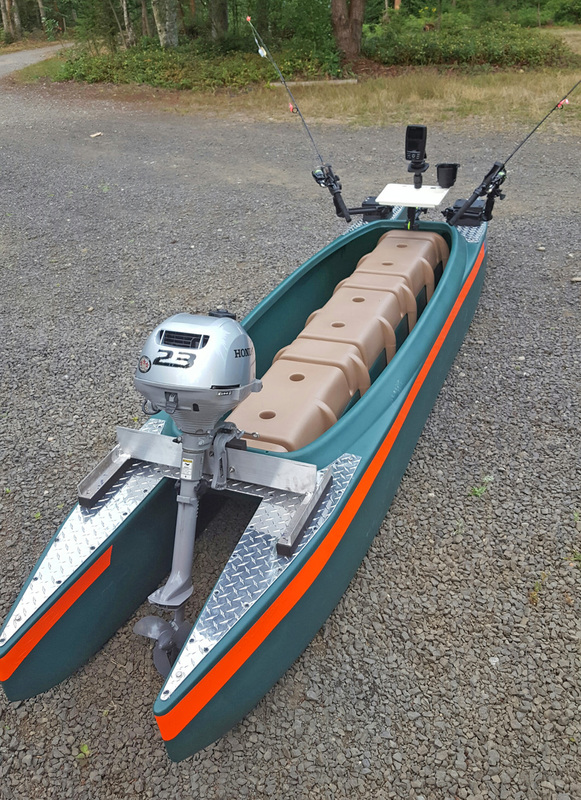 This is a sweet boat and great job! It’s important to use outboard motors with a long (20″) propeller shaft, and not ones that feature a short (15″) one. 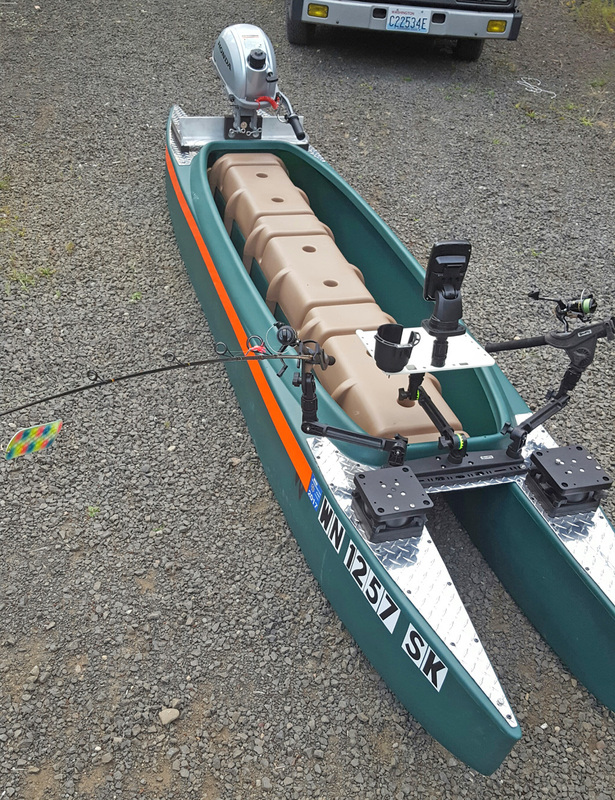 Tight lines and MoPaddle safe.